Eating this for lunch one day, a couple friends asked me what I was having. 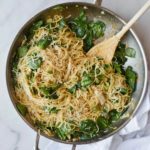 It’s hard to reply “spaghetti carbonara” and not feel pretentious. So I was downplaying as much as possible and sneaking out the words. BUT IT’S REALLY NOT A COMPLICATED DISH. You could do it. And then you can be non-chalant with your impressed friends. The other reaction people have is, “Oh. 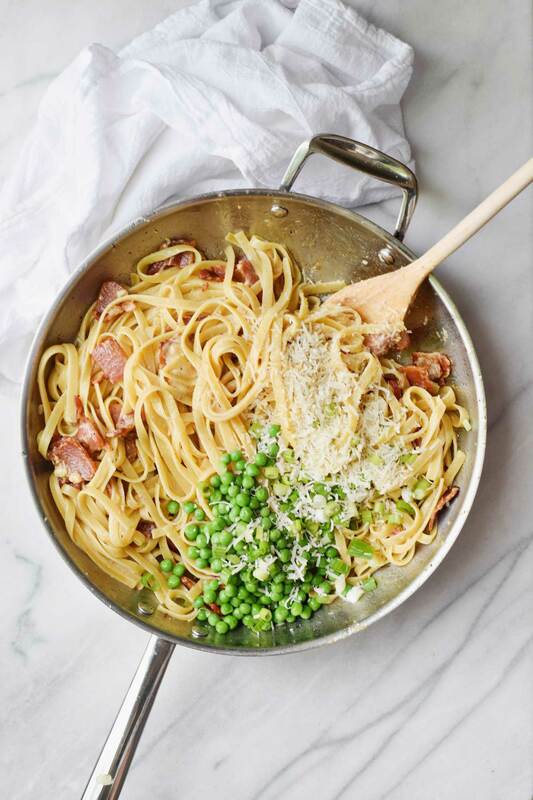 What actually is spaghetti carbonara?” Simply a pasta dish based on eggs, cheese, and pepper. It’s popular to add green peas too. And I, of course, did bacon. Cook bacon in a skillet over medium heat until crispy, stirring occasionally. Do not drain bacon fat when done. Season bacon with pepper. Prepare pasta according to package instructions. Add peas one minute before cook time is finished. Reserve one cup of pasta water. Whisk 2 tablespoons pasta water into warm bacon fat. Add all of egg mixture to pan and stir. 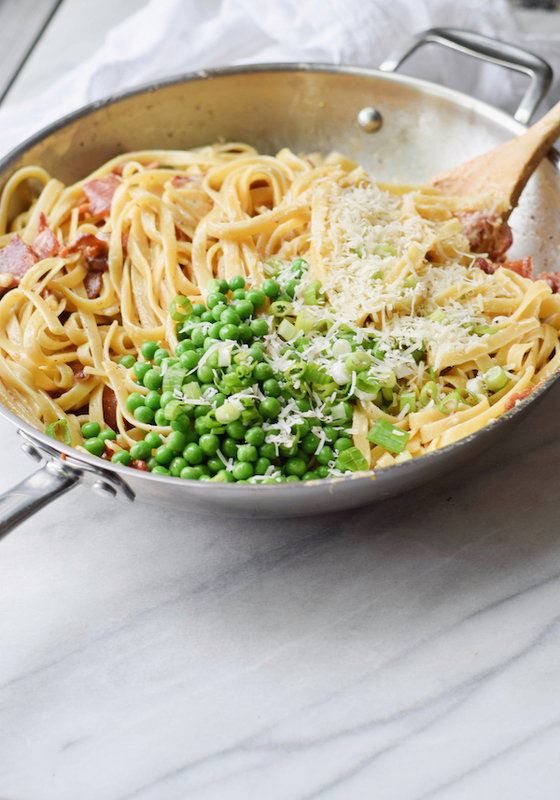 Toss with linguine, peas, parmesan, and green onions. 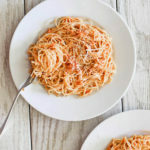 I absolutely love your recipes!! This on is super delicious, but I’m not sure if I’m making it right. 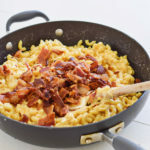 Last time I made it, I didn’t drain the bacon fat and mixed it with the pasta water as instructed, and then put everything back in the pan with the bacon fat, and it was wayyy to greasy and oily from the bacon fat. Was I supposed to only use the 2TB of bacon fat mixed with the water and then combine everything in a clean pan, or just drain off the excess bacon fat after I combine everything? 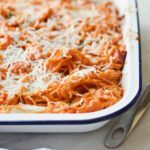 Thank you so much for all of your awesome recipes! You’re welcome Mackenzie, thank you!! It could definitely vary based on your bacon cut and how fatty it is! So glad I found your site. Your husbands a lucky man. Also like website design. Can I hire you to be my chef.